(1936) Tom Bergin’s Public House | Remains of L.A.
-From the outside, it looks like an Irish tavern, with brick on some parts and white walls and heavy wood beams on others and a dark green sloping roof, and stained-glass windows. One enters through a door off the parking lot and finds themselves in a sort of an entry way… really it’s just an in-between space —to the right is the Horseshoe Bar (actually more of an oval) and to the left is the restaurant part, just a long room with booths for eating, and beyond that the back room with a red-felt pool table and huge fireplace, and more tables. 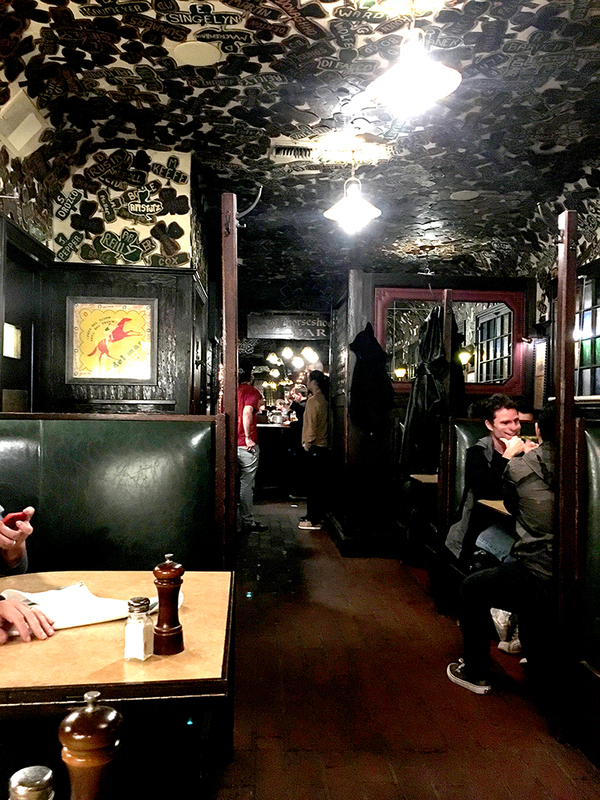 Every inch of the ceiling, throughout the bar and front room of the restaurant, is covered in paper shamrocks with people’s names written on them. It’s a cacophony of shamrocks —I know cacophony usually refers to noise but you’ll have to trust me. Thousands of people have their names on a shamrock up there. I wish I did. The horseshoe bar has a long, oval, polished wooden bar (I suppose it could be a horseshoe, but it’d only fit a horse with really weird messed-up feet) and wood stools, and booths along the back wall. Lots of wood and heavy beamed ceilings and the floor is made of well-worn brick. Lots of pictures on the walls and sports banners hanging over the bar. The restaurant part, to the left of the entrance, is a sort of long corridor with booths in green leather and burnished wood, and dark paneled walls hung with pictures of racehorses, and red plaid carpet, and stained glass lanterns. And, again, hundreds of shamrocks, covering the ceiling and coming partway down the walls. 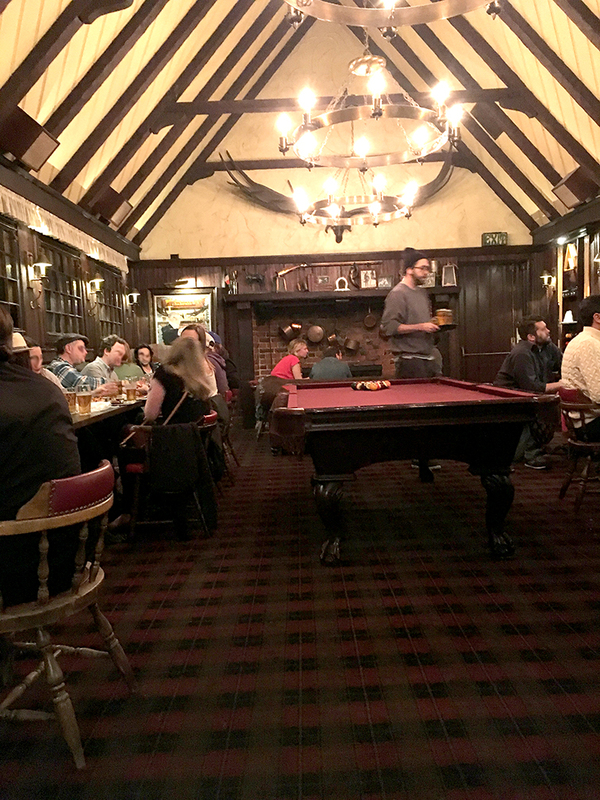 Beyond that is the back room, with a red-felt pool table in the center, and tables and chairs along the sides, and a steep ceiling with dark wood beams and wood chandeliers and, on the back wall, a simply gigantic rack of antlers. 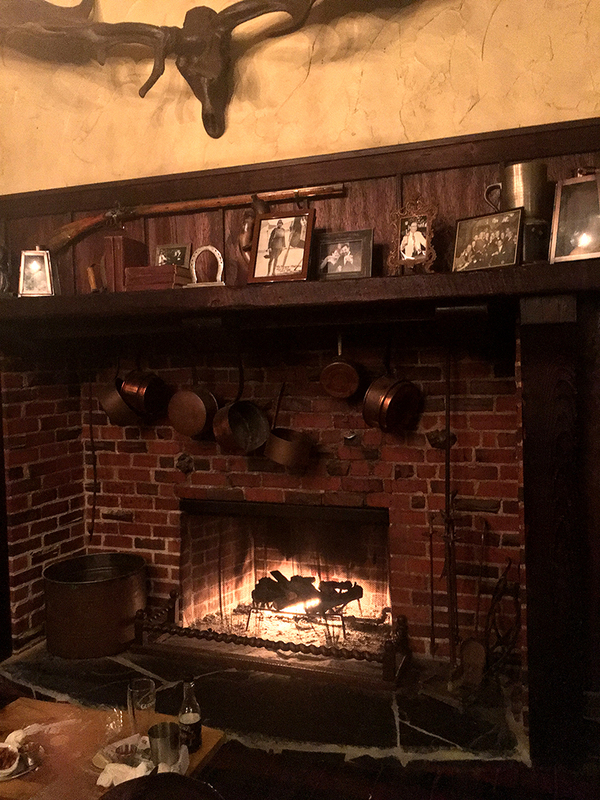 Under the antlers is a large brick fireplace, with a mantle covered in framed photos, and copper pots hung on the brick. There are lots of pictures of horseshoes, and horses, everywhere. The feel of the entire place is old wood, worn smooth, and dark leather. It’s immensely, wonderfully comfortable. – The food menu was extremely abbreviated; the only items were four appetizers: pretzel, crisps, side salad, fries; and four entrees: Fish and chips, Tom’s BERGer, fried chicken sandwich, reuben sandwich. When the waiter came, he told us that they were all out of the Tom’s BERGer and the reuben, so Suzy got the fish and chips and I got the fried chicken sandwich with fries on the side, and we ordered a pretzel to share. I asked for the sandwich without mayo, and the waiter wrote it down, but when it came it had coleslaw (and, so, mayo) all over it. If I weren’t allergic I would have just gone ahead and eaten it, but I really am very allergic. Only sending it back felt wrong because there were clearly only about seven sandwiches left in the whole place and this was one of them. So Suzy suggested I take it home to David (my husband) and offered to share her fish, which she assured me she couldn’t possibly eat all of herself. I’m not much of a fish person, generally, but it was crazily delicious, and the fries were wonderful. Best of all was the pretzel — hands down the best pretzel I’ve ever had. There was nacho cheese to dip the pretzel in, but it just got in the way. -The whole place was unbelievably crowded, but it was a nice sort of crowded, because it was clearly full of people who’d heard it was closing, and loved it so much they had to be there, even though it was so crowded. So it was like a celebration. A sad celebration, but still. We were hoping to get a table to eat at, and were told there was a guy to give our names to. It took us a while, but we finally nabbed him and he told us that it would be at least an hour before a table was ready. Suzy and I did that thing where we were both totally fine with waiting but worried the other person might not be, but luckily got it figured out fast and gave him our name. Then we pushed into the crowd at the bar, because we heard our friend Eric was there somewhere. 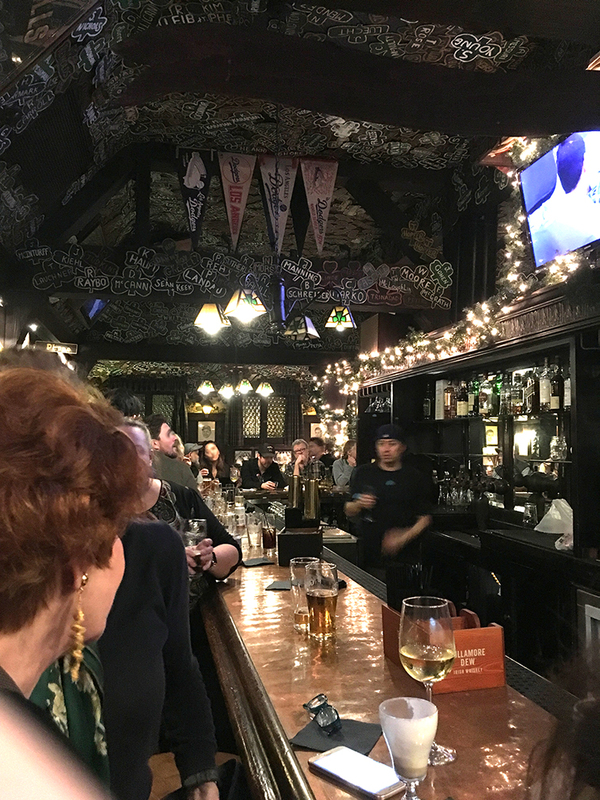 He used to live in L.A. before moving to New York, and Tom Bergin’s was his favorite bar, and he luckily happened to be in town when the news of its closing came out. We found him, eventually, and Suzy chatted with other friends she bumped into (I chatted too a little but it was loud and I didn’t know them so mostly I smiled). Then we decided to get drinks, which was a whole thing because there were just so many other people who also wanted drinks, and right as Suzy finally got the attention of a bartender our name was called for a table; it had only been about fifteen minutes but I think a lot of people on the list before us had given up. -While I don’t know for a fact that Gene Kelly used to drink here, or that this is where Maureen O’Hara brought her parents when they were in town, it’s the easiest time I’ve ever had imagining something. Everything about the place reeks of its history, of the people who were here in years past. -Suzy said the bathrooms were “notoriously small” but when I went into the ladies’ room off the bar I found it quite roomy (if disappointingly undecorated). It’s possible, though, that I only thought that because the bar was so crowded, and the bathroom blissfully empty and quiet. -There was a bartender named Michael who Eric said I should try to talk to, because he’d been at Bergin’s forever and had stories. You could tell just looking at him that that was true, but I was too shy to approach him – he was surrounded by people who loved him and I didn’t want to interrupt when I wasn’t even sure what I’d say. 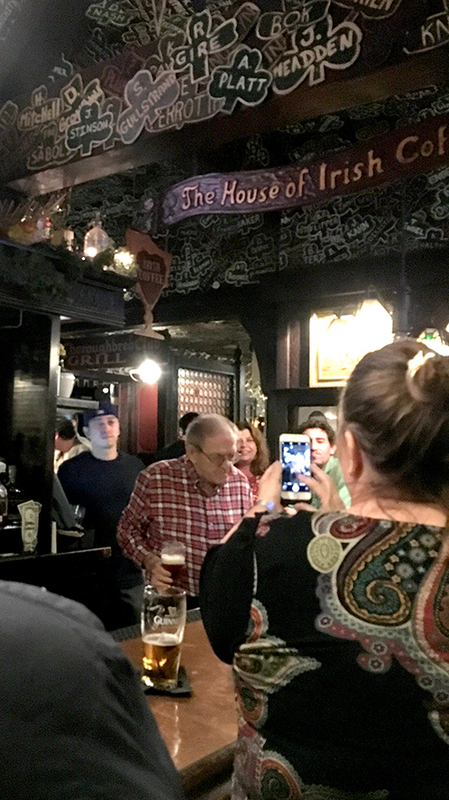 I did get close enough to hear him announce to a delighted group: “Tomorrow I dance on the bar!” and then he put his hands on his hips and did a sort of jig. I heard later that he did once dance on the bar, on this 80th birthday, but I couldn’t hear how long ago that might have been. -The fish and chips were on wax paper printed to look like newspaper, you know because fish and chips always come wrapped in newspaper in England (and, I suppose, Ireland?). We of course read the paper, it was “The Times, or Daily Universal Register” which is what the London Times was called at first. The year looked to be 1765, except the paper didn’t start until 1785 but whatever. Here’s the weird thing: It was dated Wednesday, January 17th, and we were sitting in the booth reading it on a Wednesday, January 17th. We discussed what seemed less likely: that they printed out new wax paper ever day, and had even done so today when they were so crazy chaotic and running out of food, or that we happened to arrive not just on the same date but in a year when that date coincided with the day of the week? We considered asking a waiter but they were just so busy and distracted we didn’t want to bother them, and then we forgot. So I looked at pictures on Yelp later and yes, it’s always Wednesday, January 17th. I mean that’s bound to happen sometimes, of course… But January 17th has only fallen on a Wednesday twelve times since the restaurant opened in 1936. I don’t believe that coincidences mean anything magical, or anything, but it’s still fun when they happen. -I thought I heard the waiter tell the next table over that they were all out of Guinness, but mostly they seemed to be well-stocked in drinks. Suzy got something called a “Molly’s Irish Mule” which is like a Moscow Mule —comes in a copper mug and all— but made with Bushmills whiskey instead of vodka. David (my husband) drinks Moscow Mules sometimes, so I understood most of this. I got club soda, with lime in it. It was very nice. -Strangers were talking to one another a lot. 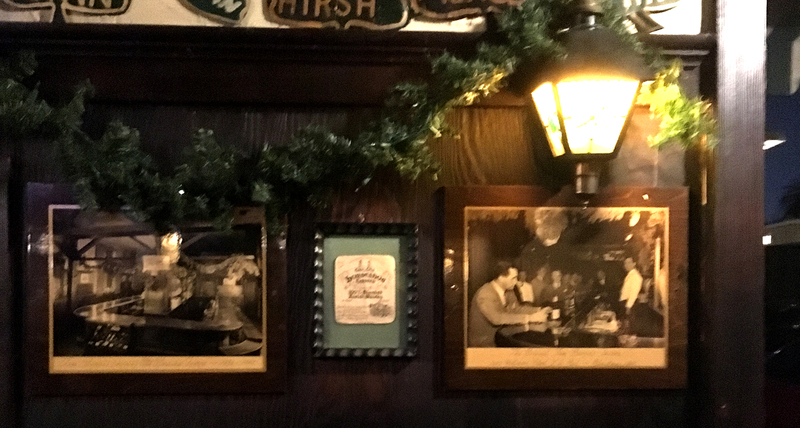 Maybe that happens all the time in Tom Bergin’s but it seemed more like it was a special occasion — that because we were all there because it was closing, it was suddenly like we were all acquaintances who had a friend in common. -The booth we were in was one of those types that can be a long oval for a big group, or, if you remove the middle part, can be two small booths. We were in one corner, on adjacent sides of the square, able to look out at the restaurant. It was perfect for watching all the people and also for sharing food. -There were pictures of racehorses on the wall behind us. One was named “Prince Blessed,” and another was “Viking Spirit,” both of which are great racehorse names. The third was “Mr. Consistency.” I felt a little bad for him, thinking it was faint praise, but then Suzy said she just thought it would be a lot to live up to, and the more I thought about it the more it seemed to me that a name like that could be a badge of honor. But then, wouldn’t the horse have been named when he was a baby? How could they have known, yet, that he’d be consistent? Of course I’m just assuming they meant he was consistent in how he raced. Maybe he got the name because he consistently neighed three times after eating, or something. -There was a guy walking around with a bowler hat with a flower coming out of the top. It seemed like the hat he probably only got to wear on certain very special occasions. I bet he was really glad when those special occasions happened, because it meant he could wear his hat. Even though this was a sad occasion, it was still a pretty good hat. 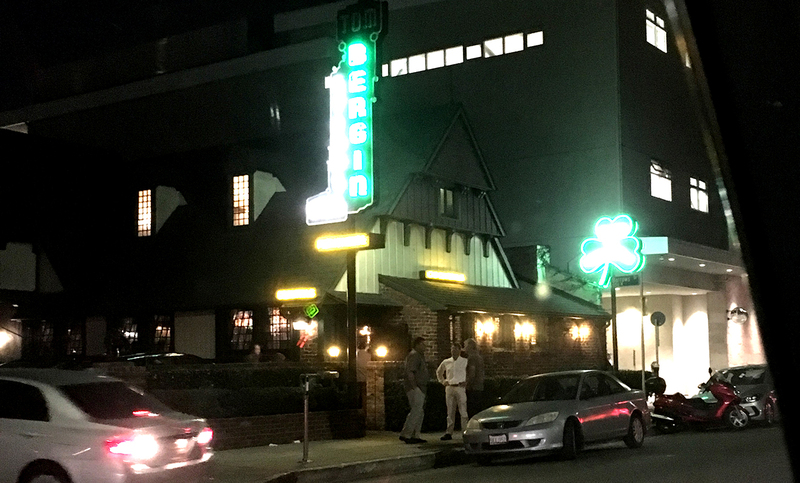 -Suzy said she’d heard that Bergin’s had the second-oldest liquor license in L.A. I found that referenced elsewhere but I’m not sure it’s right. According to this LA Magazine article, the first place (that’s still open) to get a license after prohibition was Cole’s, and the second was the Biltmore Hotel (should I do hotels on this blog? I think maybe I should). And those were given out in 1933, a few years before Tom Bergin’s opened. But it’s possible that maybe they lost their licenses at some point and then got them back, so this one is the among the oldest? Anyway, it’s old. 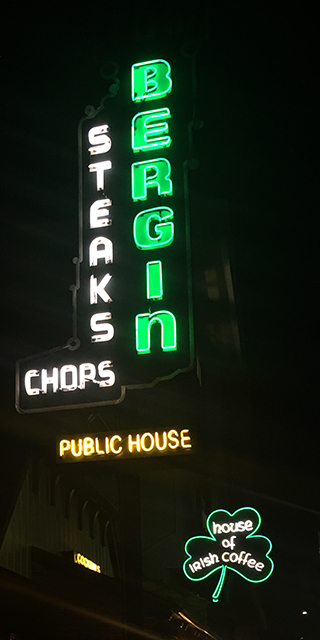 I’ve never put much value in “oldest” or “second oldest” or “the first place, without booths inside city limits that also served milkshakes, to do [whatever].” It’s really old and awesome and they’ve been serving drinks for a long time, is the important part. -We kept seeing regular customers awkwardly hugging waiters. It was sad and sweet. One of the waiters told us he’d only just gotten back from visiting family that afternoon, had gotten to work and heard the news. He said he was heartbroken. -I wandered into the back room to look around. No one was playing pool but there were lots of people, all the tables were full. 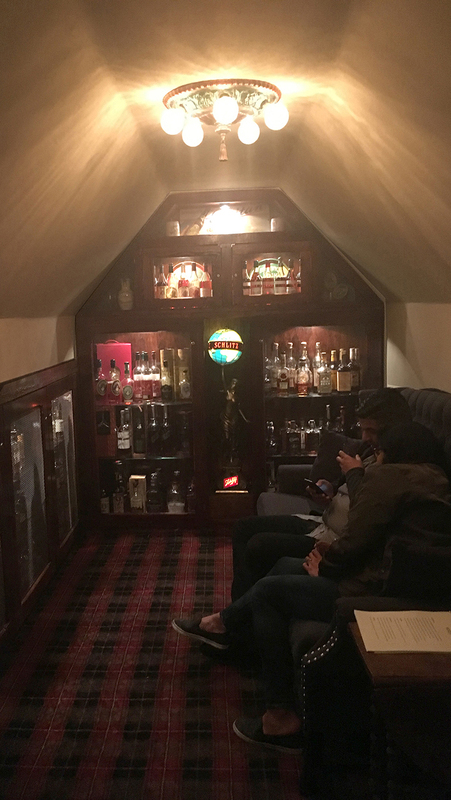 There is a couch in front of the big fireplace, and a man and woman were sitting in it, drinking. I suspected this was not their first drink of the evening. She was saying, “I’m so grateful because I called you that night and you said, ‘what would that accomplish.’ That’s what you said. ‘What would that accomplish.’ Blew my mind. So grateful, so grateful you said that. ‘What would that accomplish.’ Hadn’t even thought of that. ‘What would that accomplish.’” She went on and on. While she spoke, the man stared into the fire, nodding slowly and looking wise. One of the pictures on the mantle was Tom Bergin wearing a pilot’s uniform, in World War One. -After we’d eaten, Suzy and I pushed back into the bar and found our friend Eric again. His other friends were just leaving so we sat with him. It was still crowded and loud but the little round booth was cozy and we were able to have conversations. At one point a waiter came by handing out green bead necklaces with pendants that said “Irish True.” I’m pretty sure they were supposed to be for St Patrick’s day. We wore them for a while and then took them off, but I saved mine and put it on my bookcase when I got home. -Suzy went to get drinks at the bar and I told her I’d pay for this round, because she’d gotten dinner, and then I panicked because I had no idea how much cash I should give her — as a non-drinker I have seriously NO IDEA how much alcohol costs. So I just shoved some twenties into her hand and when she came back she gave me change and they made fun of me a little because apparently I’d given her way too much but honestly, isn’t that better than if I’d not given her nearly enough and she of course wouldn’t have said anything but thought me a rude cheapskate who was only pretending to pay for drinks and I never would have known? Anyway then we got to have a fun conversation about how many things you have no idea about when you’ve never been a drinker. -We sat in the booth and talked for a long time. It was warm and dark with white christmas lights and lots of people. It got to be a little less crowded, but still a lot more crowded than most bars at 10 on a Wednesday night. 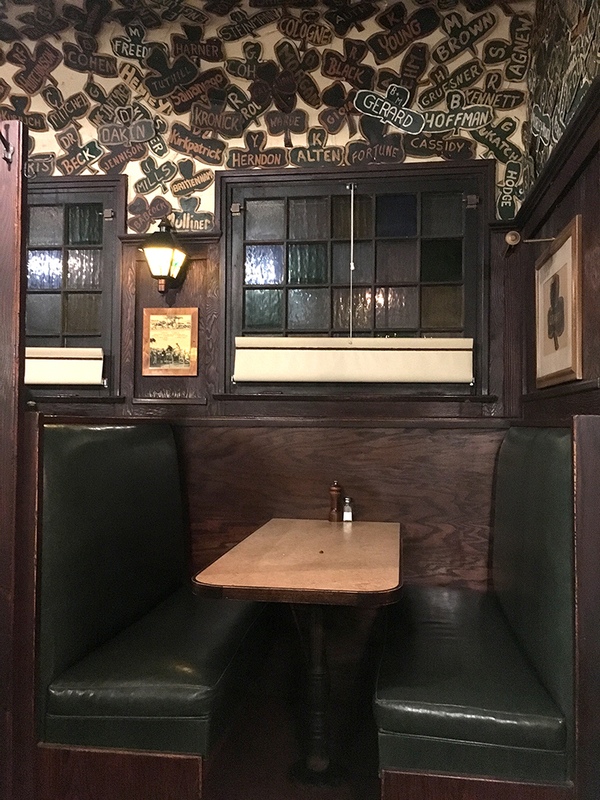 I thought about all the people who’d sat in this booth over the past seventy or so years. Famous people and sad people and excited people and people who’d just gotten to L.A. and people who wished they could leave. The thing about some places is that you just feel safe and good in them, and you know that it’s not just you, it’s the place. Something about the way it’s made, and the people who made it. Who I Ate With/Things We Talked About: Suzy and Eric; drinking, international travel, what a pain it is to break your ankle, old TV shows. What Sort of Ghost I’d Expect to Find if I Believed in Ghosts Which I do Not: So many, but my favorite is the man with a quick smile and crinkly eyes, in a nice suit and a hat, who came in every day that he could, because he knew the bartender wouldn’t treat him like a movie star but just like a regular guy who wanted a drink, and also knew that if he sat at the bar long enough, his friends would show up too, and there’d be more drinks and laughing and talking and it would be hours before he’d have to go to his big empty house in the hills. He leans against the bar now, his hat twirling in his hand, and the live people and the other ghosts swirl around him until he almost can’t tell them apart, or remember who was from his time and who was from later.